Perfect for low and medium pile carpets, area rugs and hard floors. The Complete C3 Canister is ideal for those with lots of medium- to high- pile and plush carpets, smooth floors (hardwood, ceramic, etc) and pet hair. 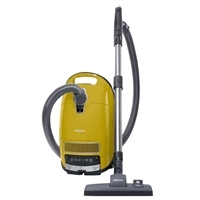 The Complete C3 Canister Vacuum Miele's top of the line canister, its ideal for all kids of carpets and soft flooring (hardwood, ceramic, stone, etc.) and those with pets.